Brian Heyes retires from Leyland Band after over 30 years of service. A figure synonymous with the band, Brian has played an influential role in the success of the Lancashire outfit since joining in 1987. 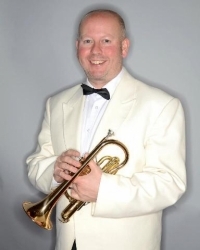 Brian holds the unique accolade of sitting in every single cornet seat on a contest stage with Leyland including Soprano, but in most recent years has made his mark from the Assistant Principal seat. Over the years, Brian has a built a reputation for being a high note specialist and is well known for his technical flair as well as having an ‘unsympathetic’ sound – lovingly christened by Richard Evans many years ago. His fun-loving personality has also provided many moments of entertainment at band engagements. In Brian’s final concert at Warrington’s Parr Hall, Musical Director Tom Wyss reeled off his list of major honours including winning the National Championship in 2005 and the British Open in 1994. The amount of hours Brian has spent rehearsing in Leyland’s band room totalled over one full year if sandwiched together. Leyland now looks to the future, having secured the services of highly-rated Luke Pallister who takes the Assistant Principal Seat. Luke joins after a stint at Foden’s Band.